Oh! Checking out my site huh? Awesome! I'll assume you are interested in going somewhere else now. Check out the links below or for a few more on my Projects page! You could also check out my blog! I'm still working on developing it, making it better, and all that fancy crap! 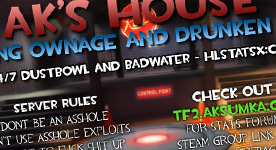 Somewhat recently I decided to try and start up a TF2 community. After getting a server running decently well out of my house, I decided to expand and buy a second. Since then this little community has been gaining speed, and players! Our server are starting to get some decent player counts, and we even have a handful of regulars now! There is still a long way to go, but at least we are moving! The Newgrounds Archive is a site I set up over 3 years ago as a place for Newgrounds member like me who still have a thing for the old NG! 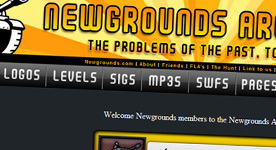 The site holds many of the old layouts that Newgrounds has sported over the years as well as a discussion forum! The BBS has been designed to resemble the actual NG BBS from back in the day! I really like being able to help people learn something new. 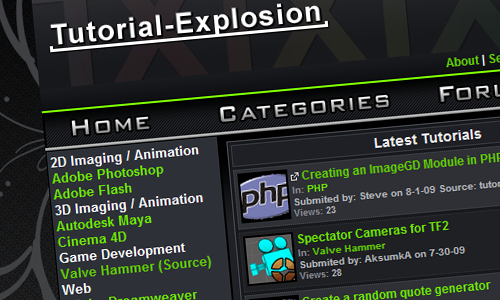 That's why a few years ago I set up a tutorial site called tutorial-portal.net. I made this site when I was still very new to the web, and so it failed (both in traffic and design). Later that domain expired and I lost it. Still wanting to teach people, I set up TX! Built from the ground up, TX is a huge step above what I had before!